"If you're considering a Canada goose novel, this is the book you must get!" My husband, Eddie and I live in Parker, Texas. We have a small lake or you could call it a large pond. Eight homes surround the pond and all the neighbors are considerate and aware of the wildlife. 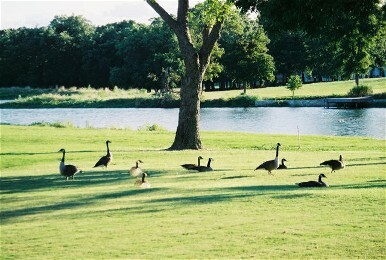 Several flocks of geese visit our two acre home throughout the year. For the past five years, they have nested each spring. We feed them cracked corn. Last spring, one family nested and had six goslings. They lost one and one developed a problem with his right leg and then, we noticed that he was missing, too. The remaining ones grew and were healthy. When it was time for them to fly off, an accident happened. We noticed that one of the babies (Sammy) was dragging his left wing. Days went by and Sammy did not improve. My husband got as close as he could to the flock and discovered that Sammy's bone was sticking out and the feathers were falling off of it. Sammy's family flies off and on but he remains at the pond and has survived the winter. He stays close to us and we feed him and the others daily. Every spring, we have one family nest on an island right at the end of our property. This year we had two families nest. One family had six babies but somehow lost two of them but now the four are growing rapidly and look fine. The other family had twelve (bless the little Mother). Anyway, they have lost two. One afternoon, the large family started honking and running with all their babies to get from the grassy area to the water. Next, I heard the noise and all the adult geese were honking and the parents of the larger group were flapping their wings in the water. Then, I discovered that one of the babies was drowning and the Dad was swooshing at him with his wing to try and get the baby over to the other bank, which is in our backyard. I quickly got my husband, Eddie and he ran down there and was able to rescue the little baby. All the adult geese were upset but they allowed Eddie to do this. They did not try to attack or anything. The baby was exhausted and at that time, the other geese and their families went back across the bank and watched. My husband came in and got a towel to clean the baby off. He wrapped the towel around him. The baby did not move for more than 30 minutes. By that time, all the others had left our area so we decided it would be best to bring the baby into our house to see if he was going to live. Forty-five minutes after the incident, the baby was better but the parents were gone and we could not see them. So we fed the baby, put him in a child's wagon that had rails on it so he could not get out and hurt himself. We placed water in there, too. The very next morning, Monday May 12th, Eddie opened our garage door going out to our garage from the house and was so surprised to find the little baby (we named him Timmy) walking around, out of the wagon, and strong. Eddie immediately took him down by the lake and Timmy jumped out of Eddie's hands before they got to the lake. Timmy ran back and forth along the bank looking for his family and immediately jumped in the water and paddled so fast down the side of the lake, looking and honking. We could not follow with our binoculars where he actually went. When we came home from work that day, we did not see any families with goslings so we decided to do some walking around the lake to see where they all could be. There is a small connecting pond to our small lake and that is where we finally found them. It seemed so difficult to get to that pond that we as humans could not do it but somewhere those families did. They have stayed at that pond all this time and today, when we got home, my husband shouted to me, "They're back, the babies are back!" We quickly went out on our deck and sure enough, there they were. One family of ten babies (these babies are looking as though they are a week away from being able to fly) and one family of four babies who can now fly. The family of ten is the one with Timmy and Eddie saved his life. There were ten babies and now there are ten so we know the family accepted Timmy back. What a great thing to be able to help and have it turn our where we could actually see that the family accepted Timmy back. We thank the Lord for this wonderful opportunity!